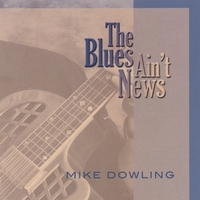 Classic acoustic guitar blues with smooth vocals, tasty arrangements, and impeccable musicianship. Mike digs deep into the musical bag of American roots guitar, favoring the melodic Piedmont style of acoustic blues masters like Mississippi John Hurt and slide great Tampa Red. But Mike can't be pigeonholed as a blues player, or even as a fingerstylist. He's far too versatile for that. From bottleneck blues to vintage jazz and much more in between, Grammy-winning Mike's musicality, depth, and mastery of the instrument translates fluently to flattop, archtop, and resonator guitars alike. Paul Kucharski hits the nail on the head when he says, "Silky smooth vocals and impeccably tasteful guitar playing". I always get goose bumps in anticipation of the latest Mike Dowling album and he never ever fails to amaze. For those of you who haven't caught him live, you've missed a real treat. This album is up there with all his previous stellar releases. Check him out, you won't be disappointed.